Art is a powerful form of visual communication and has the unique ability to convey vast amounts of information in a single image. Through personal life experience, growing up as a black male in a bi-racial family, I have seen that what we have in common far outweighs any racial or ethnic differences. Societal problems of racism, division, and inequity are pervasive problems that must be addressed and worked through in order to move forward. The legacy of Slavery, Jim Crow Laws and Segregation are a negative part of history in the United States that have lingering affects on our society today. Recent high profile cases involving the killing of unarmed black men at the hands of police stem form this history of injustice. These instances are the symptoms of a larger problem, rather than isolated events. The moralist philosophy of Dr. Martin Luther King Jr. stressed the importance of changing a society from within, while appealing to the morality and generally good nature of humanity. This stresses the need for empathy and communication as a central focus to facilitate positive change. My contribution to this goal is engaging with people through the arts, teaching and community involvement. 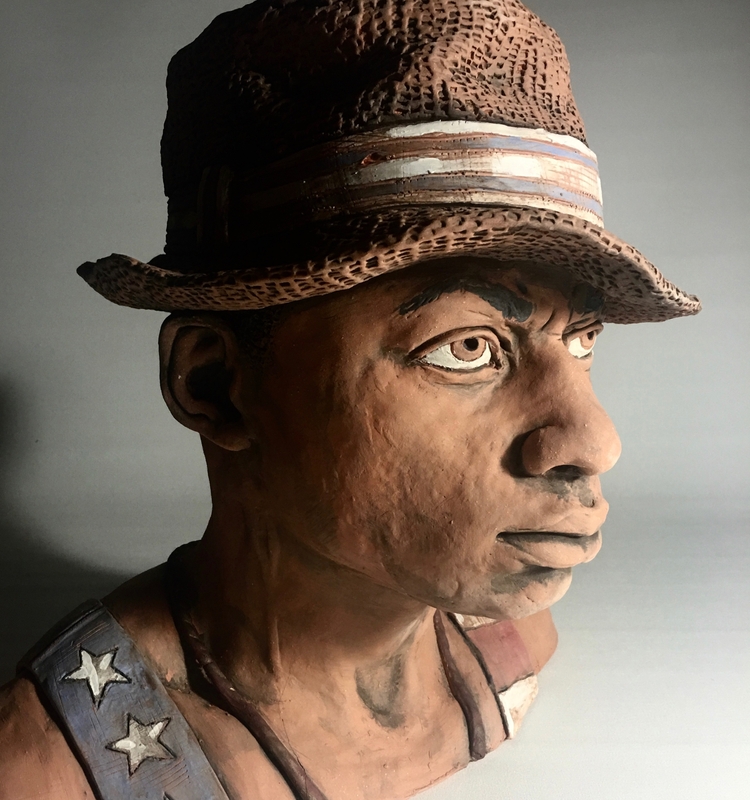 With my work, I seek to present important societal issues through the alluring lens of figurative ceramic sculpture. I use realistically modeled human forms to draw the viewer in and relate to them on a more emotional level. I invite them to consider challenging societal problems in a way that encourages further thought and discussion. Ceramics has played an important role in societies around the world dating back to the earliest civilizations. Clay remains an integral part of society today, spanning utilitarian and artistic ends. Using clay as a vehicle, I bring to life the figures that I seek to imbue with a unique sense of humanity. I use expressive gesture and emotive features to add to the human qualities of my figures. I add layer and depth to these forms by accentuating the clays natural qualities with texture and detail. I often play with proportion and visual metaphor to convey the content of the work. Expressive painterly cold finish techniques are layered over form and texture to create unique human-like objects that communicate meaning. I use ceramics as a mode of visual communication in order to engage with individuals in the arts and connect with the community as a whole. It is a crucial component of my art practice, which informs my own work in the process. In the classroom, it is my role as a teacher to learn about the subtle nuances of the clay medium but I also gain valuable insight from their fresh ideas and individual perspective. I see these relationships with artists, students and people in the community as a give and take relationship that ultimately benefits all parties.